My Mad Dad: Distraction tactics and conversation strategies. Hollingworth, R. (2018) My Mad Dad. Trapeze; Croydon, UK. We now know there are more people living with dementia. Many of us have been touched by dementia in our own lives. But most people still don’t understand dementia. And if they see or interact with someone who’s communication is slightly inappropriate or who’s language is somewhat different they are still most likely to judge them as weird, selfish or rude. Dementia can masquerade, can disguise itself as eccentricity, fatigue, old-age; it is a hidden disability. The cognitive and communication difficulties aren’t like a broken leg or a bright red rash. You can’t see them. They are abstract and often intangible and thus difficult to understand. As a health professional working with people with dementia and their families it can be difficult to support the people we are working with. We may have never been experienced the disease in our loved ones. And if we have, it is difficult to share these experiences when we are taking the role of speech and language therapist, nurse or medic. Yet people search for shared experience and understanding. Meeting other people through support groups can be extremely helpful. But there are very few written accounts of what this is like. This is why I feel the book My Mad Dad is so valuable. 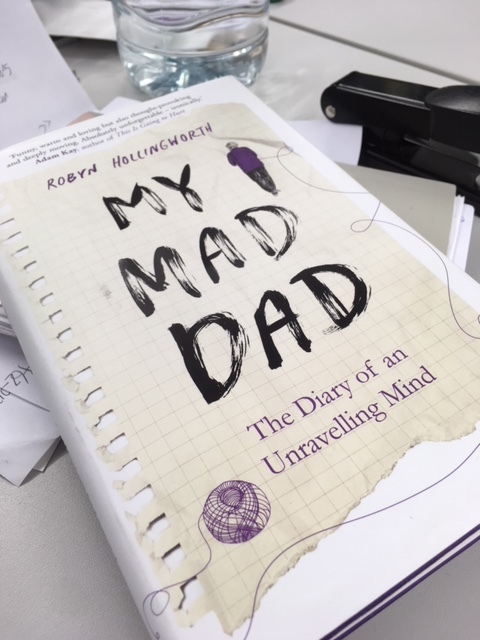 This sensitive, heart breaking and hilarious description of living with dementia is a first hand account written by Robyn Hollingworth about living with her father’s progressive illness and her mothers more sudden death. Robyn has published her story based on the diary she kept (age 25) after moving, from London to Pontypool in regional Wales, to help her parents. The account starts just a few months before her mothers death, when her father has been living with diagnosed dementia for around four years (in his early 60s). It describes Robyn’s initial adjustment from London life (Camden in the naughties) to coping with her father. Her mother is diagnosed with a terminal cancer not long after her return home. The disease progresses quickly and her mother passes away, leaving Robyn and her older brother to care for their father and one another. Their father’s dementia quickly becomes significantly worse, and he is admitted to a living facility. Robyn compares the deterioration in his health to a broken heart. Throughout the book Robyn intertwines real life events, with examples of detailed conversations between family members, her inner reflections and the narrative of her emotional turmoil. This book resonated with me as a speech and language therapist, a researcher and a person. Not least that Robyn is exactly the same age as me, and lived in London and around the same time in the same area and my Dad sounds surprisingly similar in personality. But that so much of this book is about communication, what it means, how it is perceived, the value and the complexity. I had a moment where I wanted to do a thematic analysis on the book to extract all these themes properly and scientifically to emphasise this point. ‘What?’ I replied, in disbelief that last night’s chat was stolen from his mind and replaced with a great gaping hole of knowledge. ‘Where is Mum today? Is she is work?’ he repeated. “Gareth drove us home with Dad next t him in the front and me and Mum, in her urn, in the back. ‘What you got there then, love?’ Dad asked. we had agreed best not to tell him and to keep the urn in its box, out of sight. In summary I believe this book is going to be important in contributing to people’s understanding of the impact of dementia. In particular Robyn’s descriptions of hidden disability and the frustration that goes with communicating in daily activities will make a hidden disability more visible. I also hope that themes around communication and the dilemmas of identifying how to have a conversation with a loved one with dementia will be useful for readers, speech and language therapists and people with someone with dementia in their lives. SLT career pathways: My friend wrote a book! When I was young (around 10 years old) I decided that one day it would be great if I could write a book. I really wanted to write a story, to put pen to paper and know that other people might read my words. As I got older I realised that normal people don’t become book authors (or artists). It doesn’t “pay”. I also realised that lots of people had the same ambition as me, and like me, decided it wasn’t a realistic goal. So we set about making other career goals- to become speech and language therapists. To get a job. To get a job in an area we felt passionate about. To become a band 6….7…maybe an 8. This career follows a straight forward pathway often toward management. But that really isn’t the only pathway. Recently my good friend Rhian Grounds, speech and language therapist extraordinaire, wrote a book. She and I studied together at UCL many moons ago. She worked in paediatrics and specialised in autism. She was the first of my friends to get a band 8 role. She managed a large south London trust. She dealt with budgets and performance management. And now she has collaborated with a mother of a child with autism to write an accessible and useful resource on supporting families with a child with autism at home. The aim of this book is to make ideas accessible and straight forward for parents- to think of practical solutions on managing life in the kitchen, the bedroom, the bathroom, the living room, in daily life. This book is due for release on the 19th of April (end of next week) but has already attracted a fair bit of positive interest and attention. I feel re-inspired about my profession whenever I hear about friends and colleagues achieving these amazing things- sharing their knowledge and endeavouring to support people with communication difficulties in any way they can. It also reminds me that there are a range of career pathways available for speech and language therapists – including working in the NHS, education, third sector organisations, private practice (both clinically and managerial), writing books, going into research, lecturing, working overseas and many more. I feel the need to spread the word about all the opportunities this career can offer beyond the most obvious. It can be exciting and interesting and you can fulfill those childhood ambitions in all sorts of creative ways.